Mention “MX Z TNT” and most snowmobilers would think of the lightest sleds on the planet. It was the first year MX Z TNT with the 500 SS engine package (actually a carbed 600) that broke the 400-pound barrier, coming in at 399 pounds, and the next year the MX Z TNT 1200 4-stroke that broke the 500-pound barrier for 4-stroke sleds, yet another amazing accomplishment. Fast forward to 2104 and say “MX Z TNT” and we need to get specific. 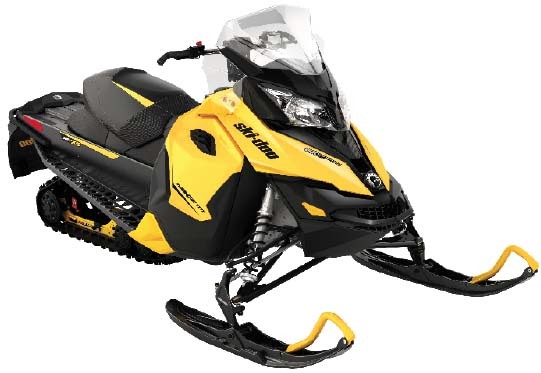 Ski-Doo only sells their X-package sleds during the spring, so if you wanted one of those sleds you had to order one on or before April 16th. Past that point in time if you want an MX Z you can get either the TNT or Sport package. And where there used to be only one MX Z TNT, for 2014 there are two body style variations and four engine sizes; the refined REV-XR body style houses the four-stroke 1200, and the new REV-XS body style houses the 800R E-TEC engine, the 600 H.O. E-TEC two-stroke engine and the new-for-2014 ACE 900 four-stroke. The best part of all of this is the fact that ALL versions of the MX Z TNT get the rMotion rear suspension. SnowTech test riders have logged thousands of miles on this new suspension and can verify it is the real deal and worth every bloody cent. No kidding, it is the best rear suspension ever offered and broadens the performance envelope of ride comfort and bump capability to new limits never before experienced. It rides smooth and supple through small bumps yet swallows the big bumps with ease and composure. Most suspensions have to be readjusted for one type of riding or the other, but the rMotion has such a broad performance window that once you set it for your weight you can pretty much leave it and ride it, and it works. It has no equal, there is no other suspension that is capable of doing what the rMotion does. 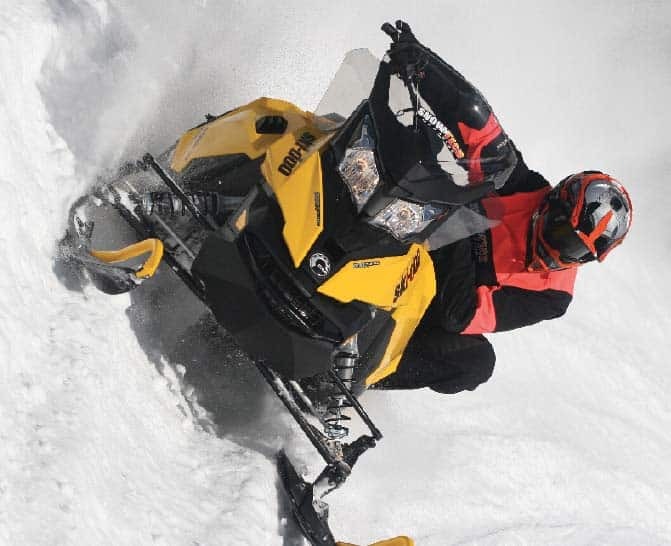 The most important message here is that the X-package sleds were spring-only offerings, so if you want Ski-Doo’s latest and greatest platform and power package your best option right now is the 2014 MX Z TNT 800R E-TEC. On the outside it might look like new plastic wrapped around the proven REV-XP platform, but there is more to it. One of the changes is found in the foot stirrup and running board support area, where the foot stirrup rear drop tube has been moved forward by 8 inches. This now allows a rider who is standing on the running board edges to place his foot up to 8 inches more forward keeping his body weight closer to the center of vehicle mass. This allows him to have much easier control and leverage over the vehicle. The toe stop itself is in the identical position compared to the REV-XP, placing the riders foot directly at the front drive axle. The front drive axle is the “center of mass” on a snowmobile and adjusting body weight from this leverage point determines the ease of vehicle control. The running board edges are now taller and three times stiffer, being 36% stronger overall than the XP. The edge is serrated to better grip your boots. Along with the new body work we get new dual air intakes, placed alongside the headlights in a high vertical position to minimize snow build-up and airflow restriction. The new intake design has a sound deadener that significantly reduces engine noise to the driver. There is a pop-off valve on the airbox with a softer spring, so if and when the intakes do become restricted the valve opens and lets the engine to continue to breathe. For servicing, the entire hood and headlight assembly lifts up and off of the sled with only four screws to remove, along with some wiring to unplug for the gauges and headlights and disconnecting the air intake tube, along with a pressure vent tube. This allows for very quick disassembly and reassembly along with easy access to the engine and all underhood components. All of the underhood systems have been developed for cleaner fit and finish. All coolant hoses, wire looms, fuel hoses, lubrication systems and ventilation hoses have been routed with maximum attention to detail for the best routing possible. All retaining brackets have defined securing locations for the hoses and wire looms for best placement possible. The REV-XS cooling system has also been redesigned with fewer parts doing multiple tasks as there is a new coolant tank, mounting bracket and hoses. A new purge collector helps to draw trapped air from the cooling system and vent it to the coolant tank. This change improves cooling system efficiency and helps to prevent hot spots in the combustion chamber. Down by the battery there is a new starter solenoid with simplified and cleaner wire harness routing for improved reliability and lighter weight. The new starter solenoid features improved internal contacts and is completely sealed, now 25% lighter and using a new mounting bracket. When you sit on the TNT, perhaps what you notice first compared to an X-package sled is how the bar risers are slightly lower – 115mm riser vs. 130 mm riser. But past that, there is little functional difference other than the exact suspension calibration. The TNT does not have the rebound adjustability on the front shocks and it does not have the KYB PRO 36 with the easy adjust knob in the rear, nor does it have the Quick Adjust option on the rMotion. Instead we find the capable HPG Plus shocks all around with no knobs or damping adjustments. The TNT also gets a new updated analog/digital gauge in the dash and a new left hand throttle block with new warmer controls that toggle up and down instead of left and right, now giving you five levels of hand and thumbwarmer control, displayed in the new gauge. 2014 also brings us a larger 15” windshield and side deflectors for added rider protection, replacing the lower windshield and handguards of last season. Being a REV-XS, you get all of the goodness of the new platform. Most evident is the fresh, modern styling of the XS with improved rider protection and ergonomics. The biggest differences come from your ability to get even farther forward and lean even more into the turns thanks to the sculpted body panels. Add to this the industry-benchmark rMotion rear suspension that soaks up the bumps, big and small, and you will be blown away by how this sled becomes an extension of your body and mind. It does what you want it to, and it goes where you want it to. And while the other sled makers talk about ride and handling, you need to ride an MX Z TNT to truly experience the best ride and handling currently available. This sled makes you a better rider in your ability to go through the bumps and carve through the turns. If you know how the REV-XP works, after a ride on the new REV-XS you will be shocked at the improvement from the rMotion and sculpted body panels. More than talk, this sled walks the walk. The heated glove box up above the gauge is neat, stash an extra pair of gloves or goggles and keep them warm and ready. The new LinQ cargo system is yet another example of refinement, a single lever and your gear bag or gas can is locked into place, or released and ready to remove. Smart, smart design. The manner in which the accessories mount, how tight they fit, it all screams quality. There’s even a GPS system that mounts right into the dash, a factory option that integrates right into your sled. Welcome to the new REV-XS. The 2014 Ski-Doo MX Z TNT 800R E-TEC engine is known for its electric-like running quality, with right about 160 HP and stunning fuel economy. The other sled makers can only dream about engines like this because they don’t have one. Ski-Doo has been building direct injection sleds for six years now. The MX Z TNT 800R E-TEC is waiting for you in Ski-Doo dealers all across North America, priced at $12,149. From the September 2014 issue of SnowTech Magazine. To see all the great articles from SnowTech you have to be a subscriber to the magazine. Subscribe here – and have SnowTech delivered to your door.